A Soyuz rocket and a Russian military communications satellite crashed in Siberia on Friday, continuing a pesky series of launch mishaps blemishing Russia's space program in the last year. Russian rocket failures have lost navigation, research and communications satellites since December 2010. Another Soyuz rocket crashed in August with a Progress resupply craft bound for the International Space Station. And Russia's Phobos-Grunt Mars probe is stuck in orbit around Earth after its rocket pack floundered shortly after launch in November. The Phobos-Grunt craft, which was designed to return samples from a moon of Mars, will probably fall back to Earth in January. The mishap Friday occurred about seven minutes after the Soyuz rocket fired away from the Plesetsk Cosmodrome in northern Russia at 1208 GMT (7:08 a.m. EST). The kerosene-fueled rocket pointed southeast from Plesetsk, a military-run launching base in Arkhangelsk oblast. The problem struck during the rocket's third stage burn, but there were no reliable reports on the cause of the failure by Friday afternoon. "This is a significant failure," said Vladimir Popovkin, head of Roscosmos, the Russian space agency. "This proves that this area of space industry is in sort of a crisis. I can say, even now, the problem lies in the engine, but to be more certain we need to take a look at the telemetry. I believe that tomorrow we will have results that we'll be able to tell you about." The Soyuz rocket is currently the only vehicle able to transport crews to the International Space Station, but Friday's doomed mission used a different version of the launcher. The booster used during Friday's launch flew in the Soyuz 2-1b configuration, which features a modernized digital control system and an RD-0124 third stage engine. The Soyuz-U and Soyuz-FG launchers, which haul supplies and crews to the space station, rely on an older model RD-0110 third stage engine. It was unclear immediately what impact Friday's failure would have on the Soyuz launch manifest. Another Soyuz was due to haul six Globalstar communications satellites into orbit Dec. 28. Soyuz rockets are scheduled to launch another Progress cargo craft to the space station in January and the next three-person crew in late March. The Soyuz rocket fell back to Earth a few minutes after launch Friday, according to reports. The RIA Novosti news agency reported debris was found in the region of Novosibirsk, the third-largest city in Russia. Novosibirsk is about 1,600 miles southeast of the Plesetsk Cosmodrome. It was carrying a Meridian communications satellite for the Russian military. A Fregat upper stage was supposed to boost the Meridian payload into a high-altitude oval-shaped orbit stretching up to 25,000 miles above Earth. This high-altitude perch, commonly called a Molniya orbit, allows satellites to stay in view of Russian territory for several hours during each circuit around the planet. Satellites in this type of orbit cover polar regions, areas out of reach of many traditional communications spacecraft in equatorial orbits. The Meridian communications satellite was designed link terrestrial military forces, ground stations, aircraft and ships with command and control centers. The craft launched Friday was the fifth Meridian satellite launched by Russia since 2006. Built by ISS Reshetnev, a Russian space contractor, the Meridian satellites are replacements for Molniya communications satellites covering high latitude regions of Russia. The string of Russian rocket failures began in December 2010 with the loss of three Glonass navigation satellites on a Proton rocket. 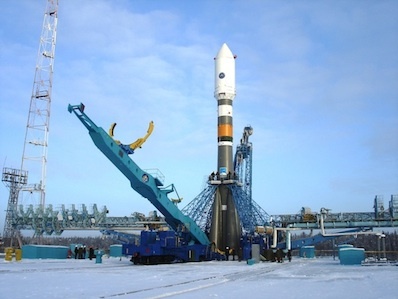 A Rockot vehicle placed a military research craft in the wrong orbit in February, then another Proton upper stage failed during a civil communications launch in August. The Soyuz rocket failure with the Progress resupply ship grounded the venerable rocket for more than a month. "Yes, there are problems, and we need to modernize," Popovkin said, saying Russia needs to upgrade facilities at its spaceports and tracking facilities. Popovkin also highlighted the aging of the Russian space workforce as a systemic problem.